"Go view the Land and Jericho" (2:2) Joshua commanded the scouts, setting up Jericho as the key to the Land, and seperate from it. Now we learn that even as the inhabitants tremble before the incoming Israel, Jericho is "closed and enclosed before the children of Israel" (6:1). 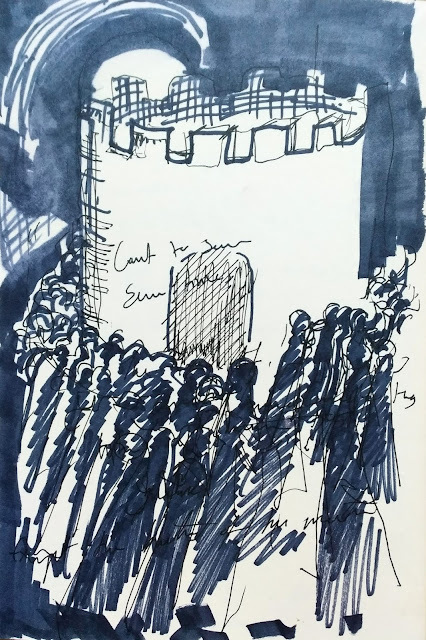 The walls, so important for the scouts encounter with Rahab, seperate the city from the countryside--just as in Leviticus 25, the city is seen as a human construct, seperating people from the direct, indelible bond to the "field." The conquest of Jericho involves circling this wall, a repetitive cyclic movement that is somehow related to the repetitive cycles of time: the weekly cycle of 6 days plus Shabbat; the seven year cycle of shemita [sabbatical year] ; and the seven times seven cycle of the Yovel / Jubilee--a connection that is emphasized by refering to the shofars carried by the priests as yovel. The nation is to circle the city for six days, one circle a day, with seven priests carrying seven shofarot-yovlot, On the seveneth day. there are seven circles, creating the seven times seven pattern of Yovel. The laws of the Jubilee (Leviticus 25) establish that the Land is God's, with humanity only granted the right of usage. Cities finction as small, humanity-centered bubbles, which allow people to cling to their ownership, even as the Jubillee dissolves it. Here, the sounding of the Yovel literally disolves the walls, merging the city with the land outside--and ending the protection of its inhabitants. The land returns to God's ownership, becoming herem (forbidden, set aside) for human usage. The city is given to Israel to destroy, but not to possess.